Presenting the spectator with a deck of cards and an envelope with a prediction. Cutting the cards in half, the spectator has a free choice of which pile they would like to use. The spectator and the magician then place their half behind their backs and without looking, they each choose one card to turn face up in the middle of their pile. The cards are brought forward and spread to show which cards were picked.Turning to the envelope, upon opening it, you reveal the prediction matches the two chosen face up cards. The interesting thing is that the cards in the envelope have a back matching the deck in use, and the face up cards in the deck have completely different back designs. Then the kicker, turning over the rest of the cards to reveal the rest of the cards are entirely blank. Masquerade comes with everything you need apart from a blank face deck. 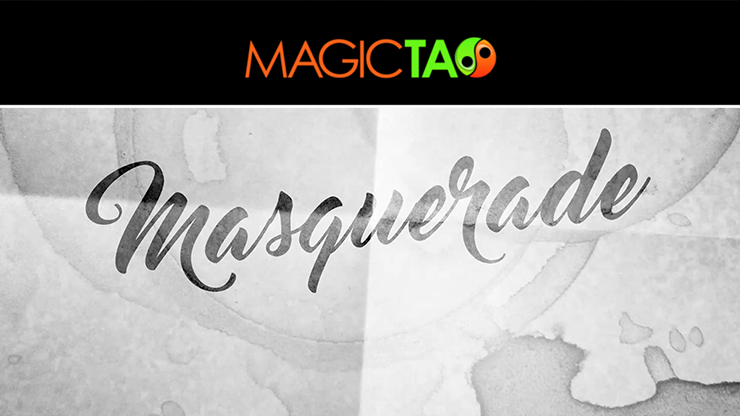 Also explained are variations and different tricks you can perform with Masquerade.